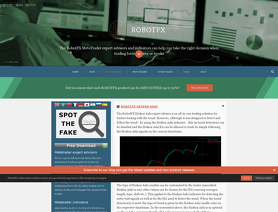 RobotFX.ro develops automated forex trading software for the MetaTrader platform. RobotFX.ro's MT4 EAs include MACD RobotFX, RobotFX Trailing Stop, RobotFX OCO News, ect. for online currency trading. Although the Fluid EA I acquired from RobotFX seemed too complicated and hard to use, the robotfx team has been kind enough to guide me through the installing process and make it work.